Correll's Adjustable-Height Plastic Computer Table is so durable and versatile that it can be used by students of all ages and sizes. Adjust the table height from 21" to 29" by simply turning the plastic knobs. Wipe the stain- and scratch resistant blow-molded plastic top clean as needed. The steel frame features offset legs that offer more room than traditional table styles, and adjustable nylon glides keep the table from wobbling. This Correll Adjustable-Height Plastic Computer Table is 30" wide by 60" long and comes backed by a five-year warranty. Correll's Adjustable-Height Plastic Computer Table is so durable and versatile that it can be used by students of all ages and sizes. Adjust the table height from 21" to 29" by simply turning the plastic knobs. Wipe the stain- and scratch resistant blow-molded plastic top clean as needed. The steel frame features offset legs that offer more room than traditional table styles, and adjustable nylon glides keep the table from wobbling. This Correll Adjustable-Height Plastic Computer Table is 30" wide by 72" long and comes backed by a five-year warranty. 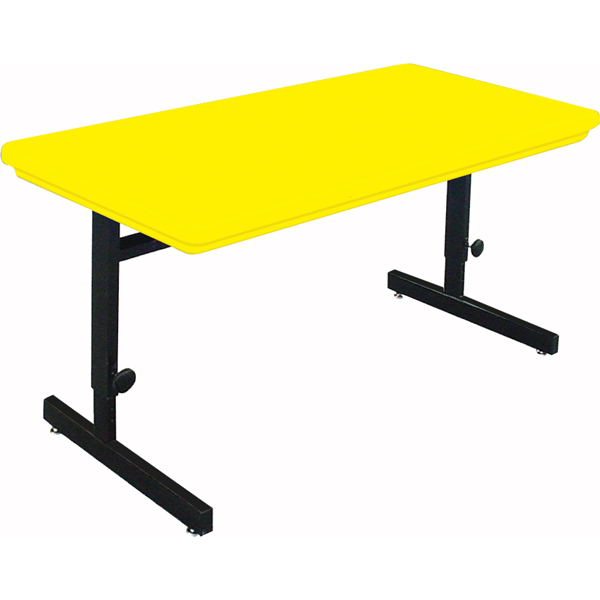 Versatile and durable, Correll's Plastic Computer Tables are a great choice for students of all ages and sizes. Simply turn the plastic knobs to adjust tables from 21" to 29" high. The scratch and stain resistant, blow-molded plastic top is easy to clean. Browse our selection of sizes below. Call our customer service team at (877) 839-3330 if you need help placing your order. We are always happy to assist you.